The case on the back of the screen seems to have come unglued at one corner. When I close the screen one corner doesn’t sit flush. You can lift the flap up enough to see the glue that was meant to be holding it together. Is there a way of re-glueing this back? Or any other suggestions? As you can see the screen is fine, still attached to computer, but the actual case or shell of it has come away. When I pry it open a little it is possible to see where the glue was which stuck it down. Do you think I should try to glue it back? When I squeeze the lid down gently it fits back into place. If I were to glue it back is there a special glue I should use? A heat resistant one? Can you take a close up picture to share? That would be helpful. Rupert what was the glue you used. My laptop is headed the same way. I hate to say but it is the same corner as yours too. Its not as bad yet but the black thing that covers the hinges is coming off and when I move the screen I can see where the glass is coming out of the housed aluminum cover. I have the same problem in the same corner. I never dropped it, It's just been separating more and more as time goes by. did the solution hold up? I had the exact same problem and even took it to an Apple store, which said the cost of fixing it, given it was an older first generation unibody, made no sense. So, I was on my own. 1) Carefully took pix of everywhere there was glue inside the case. 2) Scraped out the old glue and noted its locations. 3) Sanded these locations lightly with high grit paper (600 I think). Vacuumed carefullly. 4) Treated these spots with a weak acid to etch them, I think I used vinegar. 5) Wiped it with rubbing alcohol to clean all residue and aluminum dust. 7) Clamped it carefully, just enough to hold together, and make sure you don't let the case skew while clamping. Undue and realign it if needed. Left it two days. Result: it worked. The case cover is back on, the screen is not coming loose, and it has held up 6 months now. Even getting very hot at times. It works. NOTE: I do carefully baby the hinge, i don't just open and close it like when new, i continue to press down on the back and slowly open to minimize pressure on the hinge and reverse this when I close. Anyone who has the loose hinge knows what I am talking about. IT can't hurt to keep it stressed as little as possible. That said, I have forgotten one or twice and just slammed it shut or yanked it open. No problems. Did you take the entire back of the screen case off before you did all of the scraping/etching and re-glueing, or did you carefully rework it in the small gap whilst the cover stayed on? Hi BabaRamDass, I'm experiencing the same problem as you, and was wondering if your hack still works or if the glue has failed now ? I imagine you had to disassemble the MB Screen to do this repair, dont you ? Thank you very much for sharing this nice solution ! The front glass is held on by an adhesive, much like the iPhone 3G front panel (if you are familiar). Using a heat gun or blow-dryer will soften the adhesive so it can be reworked. I would recommend softening the adhesive in this manner and then use some c-clamps around the affected area to hold it together while the glue resets. This is certainly no guarantee, but worth a shot if you want to avoid replacing the whole assembly. I would probably put cloth or padding of some sort between the c-clamps and the computer casing to avoid marring the case. Also, be careful to NOT over-tighten the clamps for fear of breaking the glass. Good luck! Apple has determined that under certain circumstances the rubber surface on some MacBooks may separate from the bottom case of the system. MacBooks shipped between October 2009 and April 2011 may experience this issue. 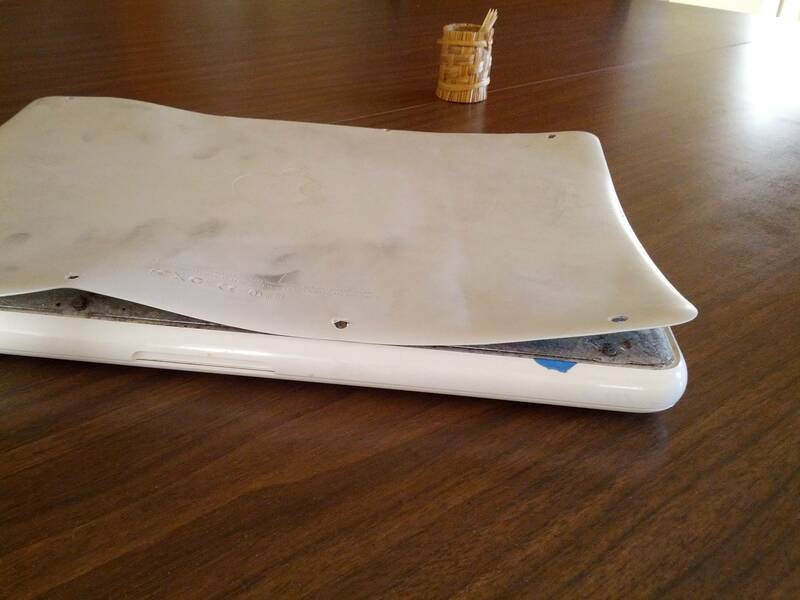 Apple will replace the bottom case of any affected MacBook, free of charge, that exhibits the issue. You may choose from three options to get a replacement bottom case for your MacBook. In all cases, your MacBook serial number will be checked to verify that it is eligible for this program. Visit an Apple Authorized Service Provider - Find one here. Order a replacement bottom case kit online. You will receive a kit that includes a new bottom case, screws, a Phillips head screwdriver, and instructions for how to remove the current bottom case and install the new one. If you feel comfortable with the self-service option, you can place your order via the web. Note: If your MacBook does not exhibit any signs of this issue, no action is required on your part at this time. If you believe you have paid for a repair or replacement due to this issue, contact Apple regarding a refund. This worldwide Apple program does not extend the standard warranty coverage of the affected MacBook. This program covers affected MacBooks for two years from original purchase date. Apple will continue to evaluate the service data and will provide further extensions to this program as needed. Your theory is a good thought but unfortunately the glue that holds the hinge to the case is not the same as the glue that holds the glass on. The glue that holds the hinge to the case will NOT soften and re-harden under the action of heating and cooling. Crossing our fingers for you! so it seems that i have tried three times with apoxi resin to fix this problem and three times the screen case just came off after about 6 weeks. the last time it came off, almost the whole case peeled off from 3 corners!! i decided to bite the bullet and take it to apple to see what they would say. turns out that because i still had applecare they just gave me a whole new screen!! they also replaced my whole motherboard and the track pad at the same time. they didnt care or even notice the bend in one corner where i dropped it which caused this problem. i would recommend to anyone with the same problem to do the same. i did scrape of all traces of the apoxi resin so they couldnt accuse me of trying to fix it myself and doing more damage. good luck all! 1) Shut the computer down completely and close the lid. 2) Lie it flat and carefully scrape away old glue on the exposed hinges. 3) Mix a full-strength two-part epoxy (it's stronger than super-glue). 4) Use a toothpick to carefully apply this to the exposed hinges. 5) Press the closed lid into it's correct place and wipe away any excess epoxy. 6) Using a cloth, two thin pieces of wood, and a loose wood clamp (or a heavy book) keep it pressed into position until the epoxy fully sets (up to eight hours). Make sure, of course, the clamp is only tight enough to hold it in place and no tighter. A day later and it looks as good as new. I've seen elsewhere that you could just use super-glue and holding it together for 10 minutes, but this fix above seems more permanent. I spoke too soon on my end... the left corner lifted again and now the right corner is up too. I can't close the lid without squeezing it shut in the back first. Had I enough time, I'd try to get Apple to fix it. But as is, I may go out and get the epoxy made especially for aluminum that's mentioned above. I finally had a chance to take this to an Apple store near Philadelphia, and they agreed to fix it... no charge. Even though it's out of warranty. I believe I heard the guy behind the counter say to a colleague "This is the third one..." while trying to get me the free fix. Now, he may have meant the third busted Macbook. Or he may have meant that this is my third Macbook in a row, though I think I'm at number five or six. Either way, I was glad they did it and very grateful. I would have bought an iPad 2 on my way out of the store, had they not been out of stock. So... it's worth a try, getting Apple to fix it. Barring that, these epoxy solutions -- maybe one special for aluminum -- are still probably a good idea, provided you do it right (I don't think I was). I found yr fix and applied 2 part epoxy resin and clamped for 10 hours (or so - just to be sure... the only time the machine has not received love). It stayed solid for about a month and then lifted again on the weekend. Has anyone else had both corners lift? Has everyone else found the fix to hold (beyond a month)? And does anyone have any suggestions?? An update for my issue as well - similar experience to Jackster... Apple Store in Australia agreed to replace the whole top section, no charge despite the fact that I was well out of warranty and no AppleCare. The repair guy said to me - "this isn't the first time we've seen this". And, like Jackster, I was very, very grateful. I was especially grateful when he looked at the epoxy resin that was left behind (after I'd desperately tried to fixit myself) and said "you didn't try to fix it yourself did you?" (shaking his head no and giving me the Jedi mindstare) and I said "I didn't try to fix it myself". He said "I thought not" and 1 hour later I had a new top for my Macbook. So my advice based on this small experience - get thee to an Apple Store regardless of warranty - preferably one connected to where you bought yr machine from so there is a personal relationship/ sales based relationship at least... if they look like they are not fixing it, well - it is clearly a design/ manufacturing flaw (not acknowledged yet by Apple - but if the glue isn't strong enough to hold the top case to the screen, it can't really be blamed on anything else except manufacturing or design). If they look doubtful, maybe point them to this thread for the many other same problems from other Macbook Pro owners around the globe. It's definitely easier for them to fix the occasional one than force Apple to acknowledge a flaw which may see thousands upon thousands of upper body sections of Macbook Pros being replaced. If your powers of persuasion don't work, then I'd go back to the epoxy. And after my experience don't ask me what kind... I clearly have no idea. do those solutions really work which is best the aluminum poxy one? mine is lifting on the left side only sticks down when i press it, i was going to go the apple store but im terrified they are going to tell me i have to replace the entire screen which ive research is £400 being a student i dont have that kind of money! had my mac book pro a year and half now. never dropped it doesnt have water damage take special care of it so really don't understand why its doing this! I had same problem. It first started on the left corner and was getting worse with time. I always noticed that the left side was warmer then the right (probably melting down the glue). Anyhow I had to do something because this problem also made the image on the screen disappear on about one fifth of the screen on left. I read this forum and others, I decided to try with the epoxy glue. Went to the hardware store and asked for aluminium expoxy. I mixed the glue and using a wooden stick that I got at Starbucks, I put a fair amount of glue between the cover and the screen along the edge. I didn't have to undo anything as by the time I decided to fix the problem, I had almost 1/2 inch gap so inserting the stick with the glue was not a problem. I then closed the cover and aligned it correctly. Once this was done I put the laptop on the edge of a table and with a piece of wood going along the back, I used two vises to hold everything in place (not putting too much pressure). I let the whole thing dry for 24 hours. The next day, when I open up the cover, it was holding firm. I did all of this about a 2 months ago and it is still holding. My laptop is 3 years old and wasn't covered by any warranty. It cost me about $5 to fix it. I made sure to wipe off any glue so it doesn't even show that the laptop was repaired. And yes I have no more problem with the image. So I am quite happy with this solution. G Toupin: Does it still hold up today your fix? LOL @ all the mess and then getting the free screen replacement :) But also this thread is awesome. Very helpful. Question -- did you all pull the screen to do the repair? Or did you try it with the screen still connected? Did you clean the surfaces of old glue, rough it up a bit, before using the epoxy? Still can't believe they used epoxy. The screw holes should be part of the rear-cover mould. Been going a month with my repair on one of these. Obviously that's not enough time to be iron clad -- but the procedure was to take the screen/back cover apart completely and get a good slathering of METAL epoxy in there (these are almost always grey/black once mixed, like JB Weld), clamp it down, and let it dry over a full weekend. Make sure you don't have excess epoxy sticking out of the top of the bottom side of the 'screen bracket' (as I will call it). The screen has to slip in under that. I was close, but had JUST enough room to slip the screen back in. It's very solid so far, but who knows. I am having the same problem. I've been checking into epoxy solutions and researching the 3M company site. I think the epoxy of choice for this job is 3M Scotch-Weld DP810. What I've also been finding out is that exposure to heat affects the bond strength of a lot of glues. I think this might be the problem for those people without drop damage -- because the hinge is near a part of the computer that really heats up, over time the glue probably loses its hold because of the heat exposure. And it probably means this is a particularly weak point in the hinge, so that if you do drop, it's pretty susceptible to breaking. since apple only sells the whole cover with display and glass for the price of a used mac, I bought only the refurbished frame on eBay from top-best, realy easy and nice, from China. DO not make the mistake of GLUING your case back together. First, take a blow dryer or heat gun if you have one. and on low move it back and forth in the area that has come unglued. then using your finger carefully press and hold the pieces back together. If you have a potato chip clip or other holder or sit a book or two on it with a pillow between it. Sorry Gary but you answered the wrong problem. I think you mean 3M double sided tape 300LSE (Low Surface Energy), not 300SLE. This double-sided tape is used to stick the glass back into the upper case. However this post is NOT about sticking the glass back into the upper case, it is about re-attaching the hinge anchor plates to the inside of the upper shell (case). Thank you for your submission but you have answered the wrong question. Also, 3M's 300LSE tape is designed for sticking things to Low Surface Energy plastics such as polypropylene and polyethylene, but neither the Mac screen (which is made of glass) nor the aluminum frame to which it needs to be attached are LSE plastics, therefore a Low Surface Energy adhesive tape such as 3M's 300LSE is NOT the best tape for the job. For more information about 300LSE and why it is not ideal for the job, do a Google search for 3M 300LSE and watch 3M's explanation. I suspect that an HSE (High Surface Energy) tape will be much better for sticking the glass back in. I just got a hand-me-down from my mom with the same issue. Now that it has been a few years since any one posted on this, how has it held up? Should I try it or save the $400 to have a repair shop put a new display on? It has been a while since anyone posted on this but I still have the same laptop all these years later and it still works like a beast! I have had to replace the whole screen assembly though as gluing it only seemed to be a temporary solution. It never seemed to fit as snugly as it did origionaly and the glue I used didn't last more than a few months. After doing a lot of research about two months ago, I bought a second hand screen from eBay. If you are in the US there are quite a few to choose from (unlike in the UK Where I had to wait for one to be listed). You should be able to pick a on up in excellent condition for between $100-$250. I would say fix it yourself obviously as iFixit has a perfectly easy tutorial on doing it. It's important to buy the right screen though so make sure you know exactly what model you have. It's worth doing because my laptop is now 8 years old and still runs all my music software perfectly and even works reasonably well on El Capitan! well, I'm in the same situation as everyone there. Spent some money to upgrade my Late 2008 MBP ( 8Gigs of RAM, Samsung SSD), and one day this huge trench on the hinge. Did the glue trick. Worked 2 months. Did it again. Worked only 2 weeks. So kept it trenched, moving / opening / closing the screen very carefully. Decided also to clean the fans ... and now I've got a nasty dust between the LCD and the glass (I know, my fault, I should have thought twice)!!! So now it's time to replace the display assembly. I have the opportunity to get a "fried NVidia" MBP 2010. Would it be possible to use its display assembly? Found a topic on using a MBP 2009 display assembly, but not the 2010 one. Or maybe I should try something on the MBP2010. Any advice will be welcome. I love my Late 2008 MBP. Still a beast. I found that the broken screw is twisted in the assembly. Ones I bent it back forth a few times in an attempt to scrape the glue out …The screw/broken assembly just fell out and the screen self clamped shut and did not really want to open back up again. Going to use some Barge Cement (the old one) and doubt it will open again. It should sit snug like the right side and if not because seemingly something looks jammed I would bet its the broken screw. Gluing that would be like pining down a spring with glue. Make sure it snugs up by itself before any glue. To all. I bought a faulty Mac with this problem and I’m about to fix it using an epoxy resin glue. I won’t know how well it works for a few months but I’ll report back if I remember. But for anyone about to attempt this repair job be aware that aluminum is a highly-reactive metal that reacts with oxygen very quickly and forms a very thin, nearly invisible layer of aluminum oxide on its surface that protecst it from further oxidation (the aluminum’s equivalent of rust). However, and most importantly, the Al Oxide surface layer is very resistant to glues, and epoxy resin will NOT adhere to it very well. I tried it and found that I could peel the epoxy off the aluminum shell easily after 48 hours. The aluminum surface needs to be properly prepared for the epoxy by sanding it down to clean shiny metal, then applying the epoxy resin glue very quickly afterwards. “How quick is quickly?” you might ask. I have not determined the time yet but by practicing on an old aluminum sardine can I found that if the cleaned surface is left for 24 hours before gluing the epoxy resin will NOT stick well. I am experimenting with gluing parts together within 2 hours of sanding and the epoxy seems to stick quite well within that time frame. BEFORE attempting to repair a hinge carry out a test by trying to stick something to a piece of aluminum - like a sardine can, and see if you can peel the epoxy off easily with a knife. If it comes off relatively easily then your hinge repair will fail. A few peole have postulated that maybe the cause of the original glue coming unstuck was because they closed the case with their right hand and perhaps that twisted the top too many times and put more force on the right hinge (or the left hinge), thus causing it to break. The real answer is much simpler. There was not enough glue applied to the hinge in the first place! When I opened my Mac case I found only half a dozen small drops of glue on one of the hinges. Of the two surfaces that needed to have glue applied to stick them together only about 10% of the surface area had remnant glue on it. The other hinge did have enough glue on it, but once the first hinge broke, the other hinge DID have too much "twisting" force on it and it broke away too. So the real reason was just sloppy manufacturing by Apple. Rupert Jarvis wird auf ewig dankbar sein.